Ben Stack Walk, Reay Forest, Loch Stack, Laxford Bridge , Lochstack Lodge. The sharp peak of Ben Stack is the most shapely of the Reay Forest summits. The climb from the shores of Loch Stack is straight forward enough with some easy scrambling to add a bit of extra excitement to the route. Arriving by car, head south three miles from Laxford Bridge and park by a small stone cottage across the River Laxford from Lochstack Lodge. A wide stalkers' path leaves the roadside and rises over open hillside towards Loch na Seilge. Above the pool, a line of fence posts and a small cairn mark the turning point on to the ridge. Head left here and the path, which is fairly boggy underfoot, ascends the west flank, initially at a fairly easy gradient. As you gain height, the way becomes increasingly steep and rocky with some mild scrambling required. Various paths continue up through the crags until finally you reach the trig point sitting at 2365 feet (721m). From the top there are excellent mountain views north to the rocky lump that is Arkle and south to Assynt. The descent over the eastern ridge is less severe and grassy underfoot for most of the way. A short pull lifts you over a low outlying top and a path drops from here to the road beside Loch Stack. Don't be tempted to head off to the left too soon as there are some dangerous cliffs below to the north. When you reach the A838, turn left and follow the single track road back to the start, skirting along above the shores of the loch. 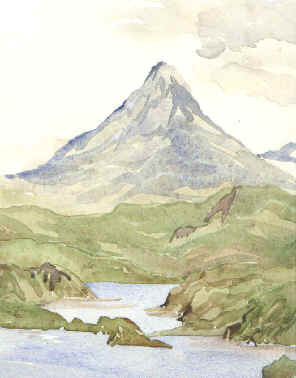 Our picture is an original watercolour painted in 1968 by Marjorie Aitken. Map OS Landranger 1:50,000 sheet 9. Start/parking Three miles south of Laxford Bridge on the A838, near Lochstack Lodge (grid ref NC 265437). Grading An easy ascent for experienced hillwalkers over one of the most impressive peaks in the Far North.